Weird, my default Viconia has Red eyes, not blue eyes. That's the red eyed one. My bad ! Edited by Aranthys, 27 January 2013 - 02:43 AM. ~artastrophe&lava - you've done something that millions were waiting for - COMPLETE new portrait pack for non-modded bg saga. Brilliant, outstanding and breathtaking peace of art. A standing ovation from me! Now, I just can't wait to see mod NPCs (like for example Angelo or Keto) in the same style. In fact i think I will stop my recent session of BG2, and wait for those, just to feel (for the first time) like they were intend to be in the game from the beggining. Well, thank you, although I'm sure it's not #1 mod for everyone, but I am really glad we did this and finally there is a mod that woul offer portraits for ALL characters. The thing is that I'm not sure when we're going to continue the work due to real life stuff + as I mentioned, Arta had to draw 50 portraits in 2 months and... that was really demanding - she deserves some rest I hope we'll continue to work, but really - we need some time off as life is beig a bit hectic lately. No trouble!! Just a bit of confusion. xD I was going to say, my first release of the alternate portraits had that hooded Viconia with red eyes as the alternate, and then I overwrote it with the dark-skinned/red-eyed Viconia on 1/17. Glad you got it figured out, though. Easiest way would actually be to commission you for Baldur's Gate NPCs portraits. Edited by Aranthys, 27 January 2013 - 07:06 AM. Kickstarter would be awesome! xD But only if it actually worked, and I'd have no idea what (if anything) anyone would be willing to pay. ^^; And yeah, obviously we went about it all wrong if we were trying to make money from it, haha!! These portraits are amazing. I saw your recent pack of 4 drow versions and they are unbelievable. Would love to see some more (okay, i'm lying, all) of the BG2 npcs in their drow form. Regardless, amazing work and I'm using these from now on, thanks very much for your hard work. I just registered an account to say thank you for taking the time to do this and for sharing it with the community. I love your style of artwork and look forward to playing a fresh game using your visual representation of all the characters. Anyway - this mod makes me wish BG1+2 uses the medium size portraits instead of small sized ones during dialogue. Your work is really incredible. Actually they are in a completelly new style (it's closer to IWD style) and that's why we offer portrait for all NPCs - you can go for all of them and do not worry about any glitches (like half portraits are in one style, while others are in a different style). Oh, I just noticed...did she create a replacement portrait for every vanilla portrait in both games? If so, I'm in awe, sir . That had to be a lot of work. Will definitely use the next time I play. Thanks, everyone!! And Lava, too, for interceding on my behalf with all the comments; he's much better at it than I am. I would prefer to just paint in my cave and never leave, except when I throw things at him to take care of -- I can't believe he puts up with me, but I love him!! @raixe : Thank you!! 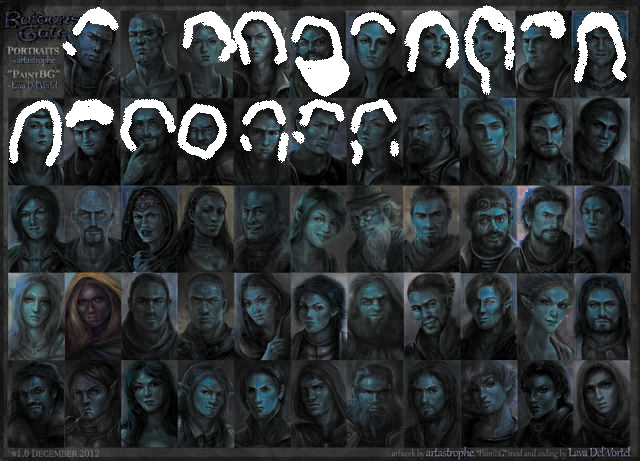 To answer your question, I think it was partly because we overwrote the selection of portraits that were included in the original game, so we had a substitute to match with each one of them--and I'm no expert, but I think it is a lot more difficult to create extra portrait spots in there that did not exist in the original code. And the other part is, I have added all of those since the initial release, and I thought that a .zip was a better alternative than forcing Lava to rewrite the code/update the mod every time I doodled something. Because as you can see, it's turned out to be quite a bit! @Galsic--yes! including some ToB smaller ones for non-joinable NPCs. And whew, it was a lot of work! But it's been long enough, now, that I forgot how much, honestly. xD But I can say for sure, I would never have been able to follow through with it all without Lava's encouragement and support. I mean, obviously there wouldn't be a mod without him, but the portrait package would have likely stayed at its initial ten-or-so characters. SO YAY BIG HUGS + THANK-YOUS FOR EVERYONE!! Edited by artastrophe, 02 April 2013 - 07:11 PM. Well, at the risk of stepping on some toes: The coding has essentially been done thanks to Daulmakan (https://sites.google...akan/home/drows). I do understand the other concerns though, so let me just instead leave it at saying thanks very much for the ones you did do. Imoen is the best of the lot. Edited by prune1, 03 April 2013 - 05:38 AM. I love these portraits, and have them installed on my BG:EE. I've been trying to install them in my BG2, but I can't seem to get them to override an old install of Enkida's portrait pack. I've tried uninstalling Enkida, and reinstalling Artastrophe's pack several times. I guess I'll have to manually fix it up with Shadowkeeper, which is a pain, but I love the portraits too much not to use them. Thank you for creating them. Edited by BelgarathMTH, 13 April 2013 - 09:50 AM. hmmm installing two portrait mods at the same time may not be a good idea, heh.